Aquassure Accessible Baths offers a full range of technical and pricing support for builders, tradespeople, architects and designers. The Baby Boomer market is large and growing. Increasingly, housing developments are targeted to this market – 55 Plus developments, Assisted Living Facilities, Retirement Communities, etc. This market has special needs in the area of accessibility and universal design. Baby boomers are often facing mobility challenges for themselves and their spouses, not to mention their aging parents. Designing for this target is especially sensitive, as designers have to walk the thin line between accommodating needs for both the present and the future without having an institutional feel and preserving the ambiance of the home. Our products offer a solution: Style, comfort, quality, accessibility and saleability! Most people can expect 10 years of disability in their lifetime. 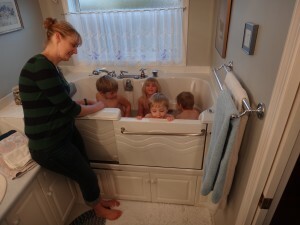 This most often affects our ability to get in and out of the bathtub safely. Help your clients approach the next stage of their lives with comfort and style. 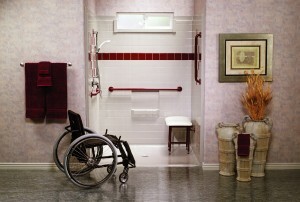 Think universal design for all abilities. Design for all stages of life with lifetime showers or deep soaker spa bathtubs. Volume discounts and technical specifications are available. Please contact us for spec sheets, CAD drawings, rfa files, and installation instructions. Click here to go to our installation page. Click here to search our product database!